This week's giveaway is from Toni of Wild Dog Studio. 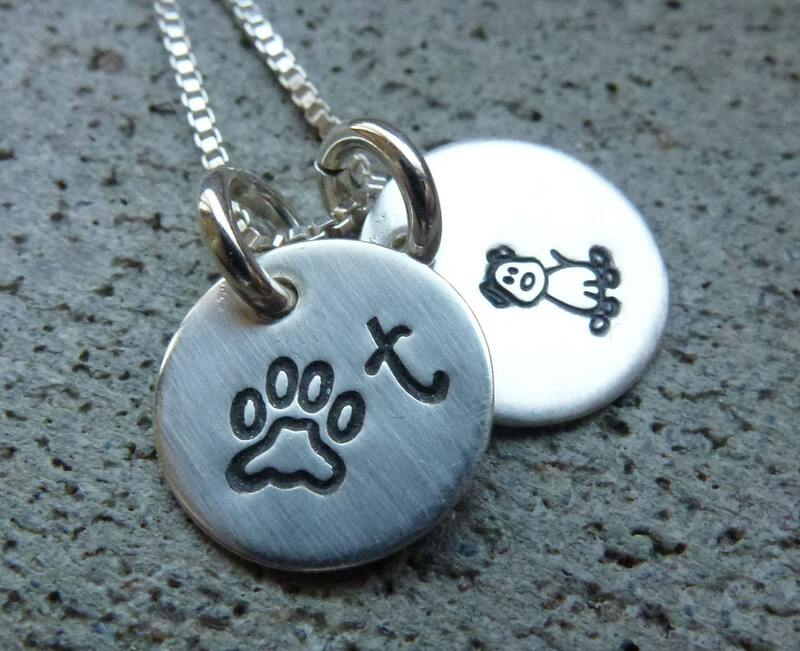 She is giving away this adorable handstamped charm necklace. This super cute necklace is made up of a 3/8" stamped copper charm layered over a 1/2" sterling silver charm. The two charms come layered together on a single jump ring and are strung on an 18" sterling silver box chain. 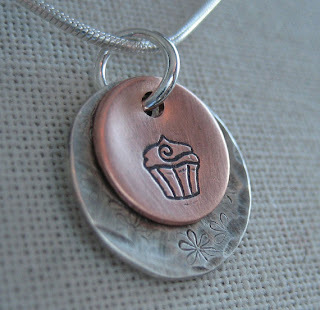 You can custom make your charm with the cupcake image as shown, or any of the other images that Toni has available. So fun! Contest ends Saturday, February 9th, at 12:00 noon Central. One winner will be chosen by Random.org. Please leave each in a separate comment, as each comment is an entry (To qualify for extra entries you must do step one above). Be sure to include your email address! 7. Become a Facebook Fan of Wild Dog Studio. Comment back here with your Facebook name. Existing fans just leave your Facebook name here. 8. Follow Wild Dog Studio on Twitter. Comment back here with your Twitter link. Existing followers just leave your Twitter link here. Obviously, winter is getting to me. I am dreaming of tropical beaches, swaying palm trees, the ocean lapping at my toes and a coconut drink. I bet many of you are feeling the same way, after these frigid temperatures we've been enduring here in Minnesota. 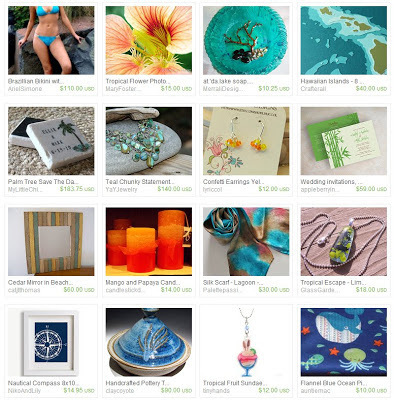 I created this warm, tropical treasury to bring you along on my tropical dream. I included a poem written by Peyton Alexis that says it all. 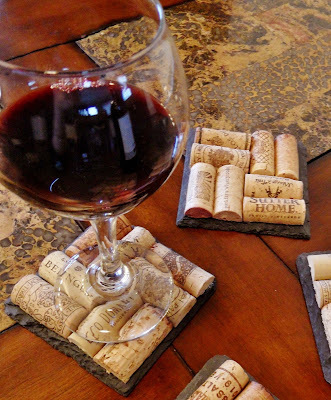 Danielle created these rustic, yet sophisticated coasters using handpicked wine corks and beautiful dark grey slate squares. Each set of coasters is one of a kind. These coasters are a wonderful conversation piece for a girls night in or dinner party! They are also a perfect housewarming, wedding, shower or birthday gift to anyone who enjoys wine or spirits! The coasters measure 4" x 4" and each coaster has 4 soft foam dots on the bottom to protect your surfaces. How to Enter: Visit Scattered Treasures, pick your favorite item and leave a comment on this post about it. (Scroll to bottom of post and click on Comments) Make sure you include your email address so we have a way to contact the winner! 7. Follow Scattered Treasures on twitter. Comment back here with your Twitter link. Existing followers just leave your Twitter link here. 8. 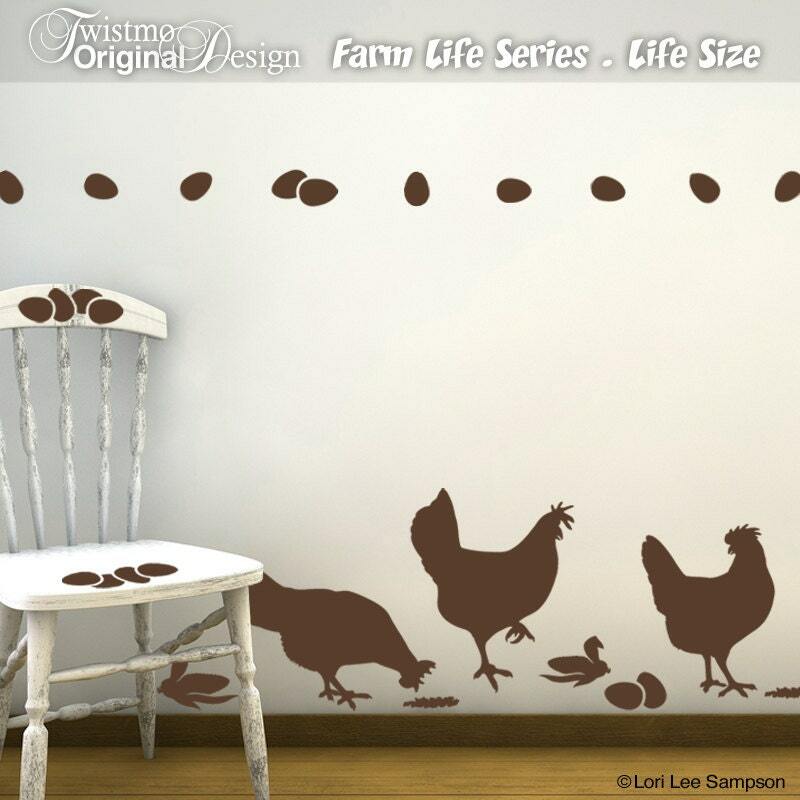 Become a Facebook Fan of Scattered Treasures. Comment back here with your Facebook name. Existing fans just leave your Facebook name here. Contest ends Saturday, February 2nd, at 12:00 noon Central. One winner will be chosen by Random.org. HandmadeMN members not eligible to win. Fun Weekend Finds ~ Welcome back, Wild! Hockey returns tonight, all! Who's ready for the puck drop? This week's giveaway is from Danelle of Florence Oliver. 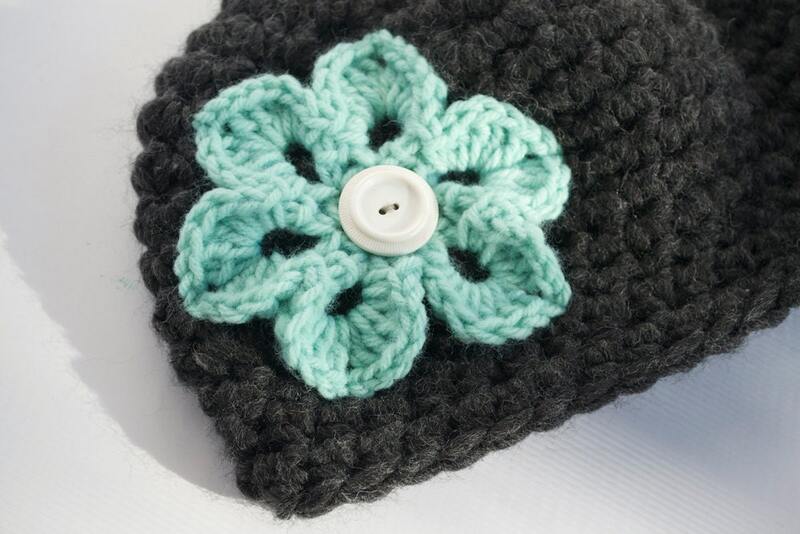 She is giving away this adorable crochet cloche flower hat. Inspired by vintage cloche hats and vintage floral fabrics, Danelle crocheted a cloche hat with a modern twist. Not only cute, this hat will keep you warm and cozy during the Fall and Winter months! Danelle used a super soft acrylic/wool blend yarn in flint gray, and adorned it with an aqua flower and white vintage button. The hat measures approximately 7.5 inches (19 cm) from center to bottom edge, designed to comfortably fit an adult 21.5 - 22 inch (55-56 cm) head circumference, but will stretch to fit almost all head sizes. Contest ends Saturday, January 26th, at 12:00 noon Central. One winner will be chosen by Random.org. 7. 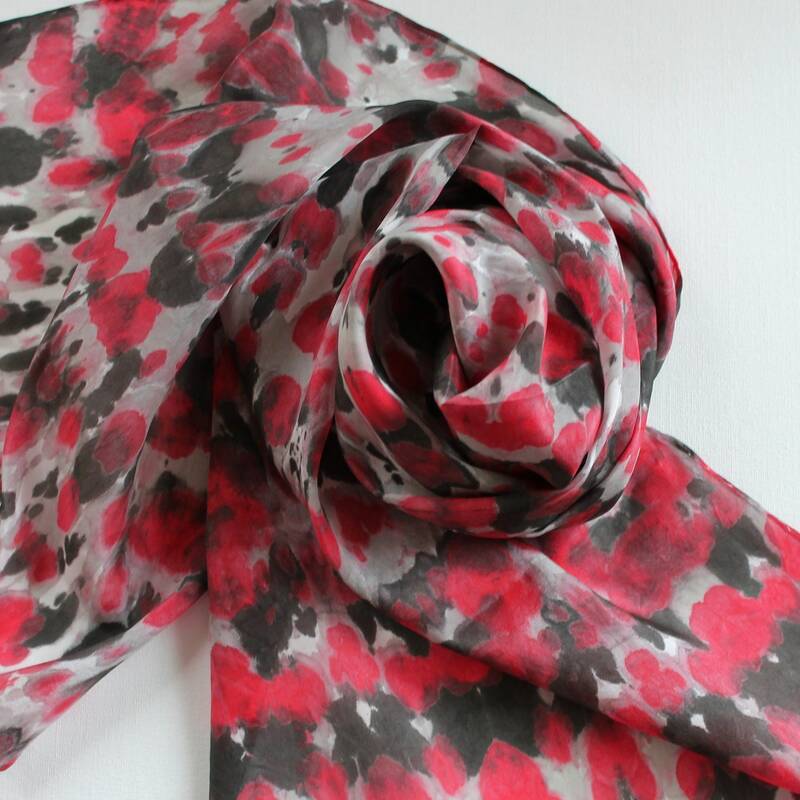 Become a Facebook Fan of Florence Oliver. Comment back here with your Facebook name. Existing fans just leave your Facebook name here. 8. Follow Florence Oliver on Twitter. Comment back here with your Twitter link. Existing followers just leave your Twitter link here. 9. Follow Danelle's blog. Leave a comment here letting us know you are a follower. If you are already a follower, leave a comment anyway, as each comment is an entry. But, cheer up! Once this dreary rain stops falling, the temperatures will drop precipitously and the clouds will move back to the Pacific Northwest where they belong, and we'll have our bitter cold and sunshine yet. I can hardly wait! 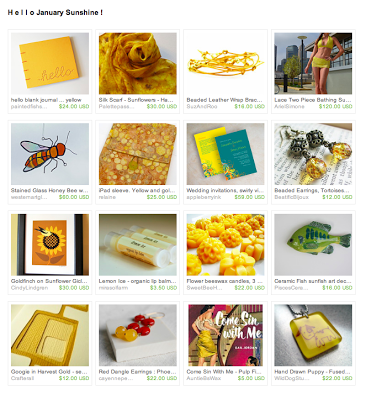 So, to accentuate the positive, let's celebrate the golden hues of the winter sun with a treasury of cheery yellow handmade offerings by Minnesota artists on Etsy. Click on the image to have a closer look at the treasury, and to visit the shops offering these delightful sunny wares, all handmade in Minnesota, with love. This week's giveaway is from Andrea of The Hobby Room. She is giving away this elegant Swarovski Element Bobby Pin Variety 4-Pack. Open to US and International (some counties may not apply). How to Enter: Visit The Hobby Room, pick your favorite item and leave a comment on this post about it. (Scroll to bottom of post and click on Comments) Make sure you include your email address so we have a way to contact the winner! 7. 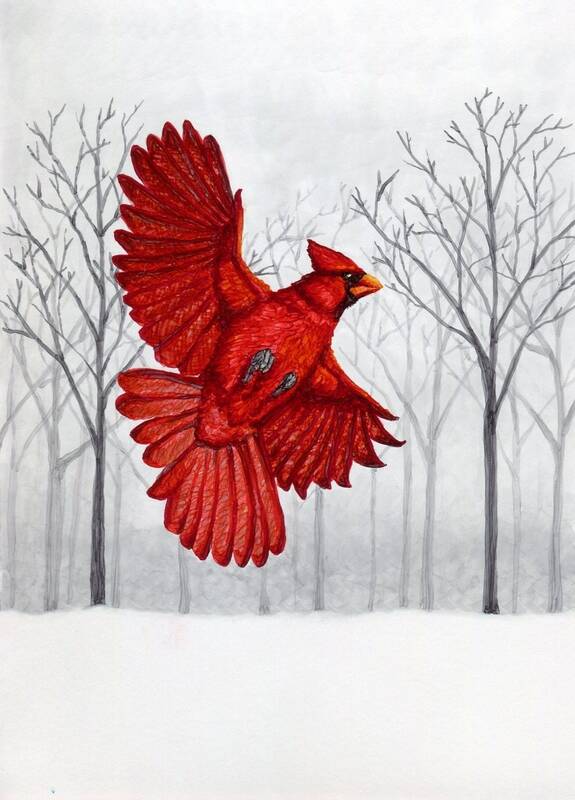 Follow The Hobby Room on twitter. Comment back here with your Twitter link. Existing followers just leave your Twitter link here. 8. Become a Facebook Fan of The Hobby Room. Comment back here with your Facebook name. Existing fans just leave your Facebook name here. Contest ends Saturday, January 19th, at 12:00 noon Central. One winner will be chosen by Random.org. 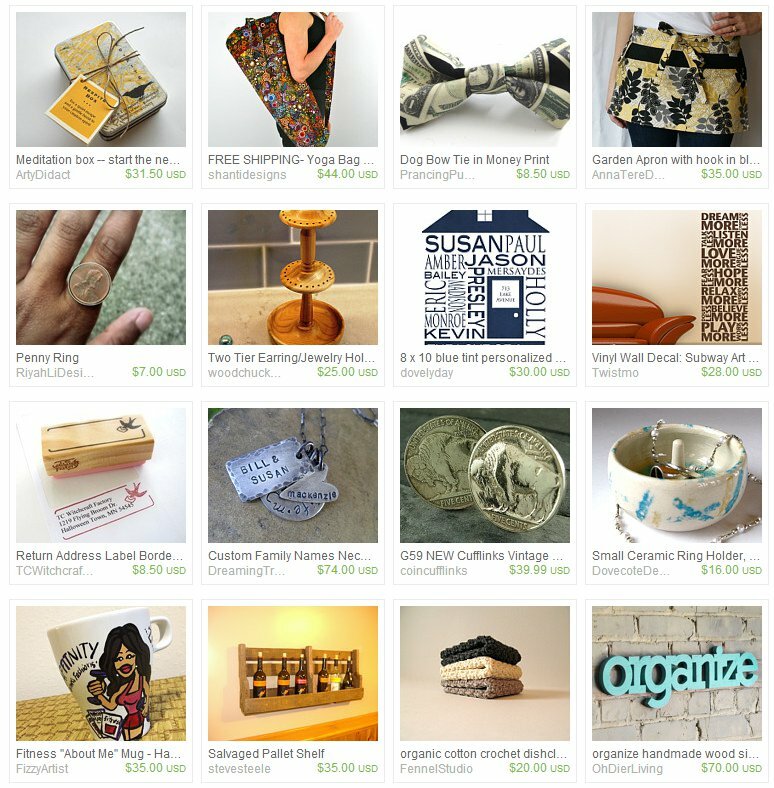 HandmadeMN Fun Friday Finds ~ Ring in the New Year! Happy New Year! What is your resolution for the new year? As you can see, I have included a list of some popular resolutions. I read somewhere that 45% of the American population make resolutions for the new year. I am part of that percentage and decided to help others follow through with their personal goals or projects. 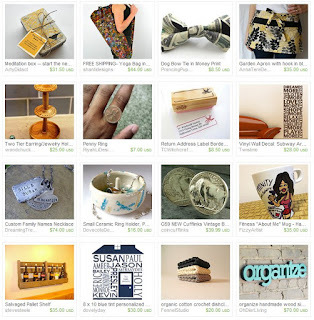 Ring in the New year with our local handmade products for 2013! Voting ENDS at midnight on JANUARY 15th.